April guest artist Jeffrey Kahane was featured on Rachmaninoff's Piano Concerto No. 3. Saturday, April 10 marked the fabulous performance by Jeffrey Kahane, who performed Rachmanoff to a full house of enthusiastic concert lovers. The story of the historic first meeting of the co-founders of Alcoholics Anonymous and their early efforts to help other alcoholics. Presented with Permission from Samuel French, Inc. Performance of this work does not imply affiliation nor approval or endorsement from Alcoholics Anonymous World Services, Inc. Try to get into see this very fine production directed by Ann Dusenberry and stage managed by Daniel Herrara. 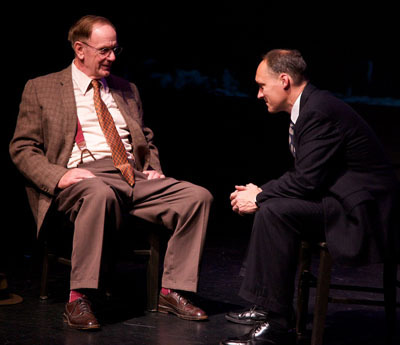 Actors Brian Harwell (Bill W.) and Tim Whitcomb (Dr. Bob) gave outstanding performances that in such a real and simple way honestly portrayed the struggles of two men determined to be well by helping eachother, and others. Jenna Scanlon, as Lois Wilson and Kathy Marden as Anne Smith truely presented the challenges and choices faced by the family members of alcoholics, and also filled the room with the spirit of experience, strength and hope that alanon is known for. Matt Talbot and Rebecca Ridenour were equally outstanding in their performances. Congratulations to everyone for a memorable job well done. Santa Cruz, CA, May 3, 2010: The Santa Cruz Film Festival, an annual celebration of independent cinema and culture in California�s Greater Monterey Bay area, kicks off 10 days of films and events this coming Thursday night with red carpet interviews and a Gala Party at the Museum of Art & History after the film, Soundtrack for a Revolution. The Festival is proud to kick-off its Ninth edition with this stirring film about the civil rights era told through the period's powerful music. Executive Produced by Danny Glover and directed by Stanford University Professor Bill Guttentag and Dan Sturman, the film features new performances by contemporary artists of the freedom songs protesters sang on picket lines, in mass meetings, in paddy wagons, and in jail cells as they fought for justice and equality. Artists including John Legend, Joss Stone, Wyclef Jean, and The Roots lent their talent to telling this story which also includes riveting archival footage, and interviews with civil rights foot soldiers and leaders such as Congressman John Lewis, Harry Belafonte, Julian Bond, and Ambassador Andrew Young. Soundtrack for a Revolution celebrates the vitality of this music and is a vibrant blend of heart-wrenching interviews, dramatic images, and thrilling contemporary performances: a film of significance, energy, and power. Before the films starts, the Inner Light Ministries Choir and Rev. 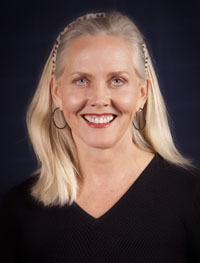 Deborah Johnson will appear and perform for the audience. Director Bill Guttentag will be in attendance as well to discuss the film after the screening. The Big RED Bus is a one-off, extreme RV fully equipped with the amazing new RED camera and RED Rocket post-production technology. The only vehicle of its kind capable of full production and distribution at that level in existence, and it lives right here in Santa Cruz. Chris Layhe will park his RED bus in front of the historic Del Mar Theatre as guests arrive for Opening Night for a "red carpet" session of interviews and uploads with Directors, Producers, Festival Guests and Fans from Festival films and events. Information about all films and events is available at www.santacruzfilmfestival.org and at the Festival's Trailer Page http://vimeo.com/channels/scfftrailers. Since 2002, the Santa Cruz Film Festival has celebrated innovative and original filmmaking in and for the Greater Monterey Bay community. Over the past eight years, SCFF has screened over 1,000 independent films and videos including scores of quality, locally-produced works to tens of thousands of enthusiastic and dedicated film lovers, generating nearly $1 million in revenue for Santa Cruz. Whether fact or fiction, commercial or avant garde, live action or animation, the Santa Cruz Film Festival celebrates the diverse art of talented filmmakers. SCFF presents artists who create films and videos in all genres from around the world in one of the most thought-provoking, entertaining, fun-filled, educational regional film festivals in the country. The Festival has been proud to not only showcase new creative talents, but to also provide an interactive experience where filmmakers, musicians, performers, artists and the community can come together to share their art and ideas and to have an enlightening and fun time. New 7-minute film about D�sseldorf wins third prize at ITB International Film Festival in Berlin and is now available in 9 languages on YouTube. D�sseldorf is a winner in the ninth International Film Festival at this year�s ITB (International Tourism Trade Show) in Berlin. The city�s image film entitled �Come Closer� won third prize in the category �City Tourism� and is now available on YouTube in nine languages (English, Chinese, Dutch, French, German, Italian, Japanese, Russian, and Spanish). The film introduces and promotes the Rhine River city to both leisure and business travelers, as well as the travel press and industry. It showcases the city�s favorite sights and attractions, including many international events and festivals, historic and modern architecture, and world-renowned art and art venues. D�sseldorf city and airport have long been destinations for international business travelers but the city is also rapidly becoming a destination for leisure travel. D�sseldorf ranks #1 in Germany and #6 on a list of global cities in terms of quality of life (Mercer Human Resource Consulting 2009). To see �Come Closer,� visithttp://www.youtube.com/visitdusseldorf. Bumbershoot: Seattle�s Music & Arts Festival announces a brand new ticket option, along with additional enhancements to overall ticketing, based on feedback from Bumbershoot fans. For the first time, Bumbershoot attendees will have the option to purchase an Economy Ticket. The Economy Ticket sells for $22 advance/$30 gate and grants the ticketholder access to everything at Bumbershoot except the Mainstage in Memorial Stadium. This ticket was created based on feedback from Bumbershoot patrons who prefer the robust and diverse programming found outside Memorial Stadium and throughout the grounds�including six auxiliary music stages, three stages of comedy, three performing arts venues, a film festival, visual arts exhibits, Flatstock, and spectacle programming in outdoor open spaces. For these fans, the Economy Ticket option provides a reduced rate for entrance that better reflects their overall interest in the Festival. Another new change is reflected in the Bumbershoot Standard Ticket, which sells for $40 advance/$50 gate, the same gate price as 2009. This year, the purchase of a Standard Ticket will include guaranteed Mainstage admission, and one ticket will grant access to both the Festival grounds and the Mainstage. The purchase of a Bumbershoot Standard Ticket eliminates the need for the ticket holder to arrive early and wait in line for a separate pass�their space at the Mainstage show is guaranteed before they arrive at Bumbershoot. For patrons who purchase an Economy Ticket in advance of Bumbershoot but decide on-site that they would like to attend the day�s Mainstage performances, Mainstage Upgrades may be purchased on-grounds for $30, if tickets are still available day-of-show. As the Mainstage venue (Memorial Stadium) has a limited capacity, there is the possibility that the Mainstage performances could sell out in advance of Bumbershoot, which should be a consideration for fans deciding between the Economy and Standard Ticket. Also new this year, Bumbershoot is hoping to make the Festival experience even more affordable for young families, and is raising the age for free admission from kids 5 and under, to 10 and under, with an accompanying adult. Free admission for kids does not include access to the Mainstage shows, as all people entering the Mainstage venue will be required to have a paid ticket, regardless of age. Adults who wish to bring their children into the Mainstage shows may be able to purchase a Mainstage Upgrade on-site for their child, if tickets are still available day-of-show, or purchase a Standard Ticket in advance for the child. Bumbershoot no longer offers additionally discounted tickets to seniors and patrons with permanent disabilities and ask that they purchase the Economy Ticket or Standard Ticket based on their desired Festival experience. As always, Bumbershoot will continue to provide access in compliance with Federal ADA regulations. Details for Bumbershoot 2010 including Festival lineup will be announced later this spring. For updated information, visit bumbershoot.org. For more information on Bumbershoot contact Mikhael Mei Williams, One Reel Marketing & Communications Director at 206.816.6454 or mwilliams@onereel.org. ASCAP (the American Society of Composers, Authors and Publishers) will honor rock icon Patti Smith at its 27th annual Pop Music Awards, taking place April 21, 2010 at the Renaissance Hollywood Hotel in Los Angeles, CA. Smith will be presented with the prestigious ASCAP Founders Award and will perform with her band at the event. The invitation-only gala will also honor the top songwriters and publishers of ASCAP�s most performed pop songs of 2009. The ASCAP Founders Award is among the most prestigious honors that ASCAP gives to songwriters and composers who have made pioneering contributions to music by inspiring and influencing their fellow music creators. Each recipient is a musical innovator who possesses a unique style of creative genius that will enrich generations to come. Past recipients include Bob Dylan, Jackson Browne, Elvis Costello, Heart's Ann & Nancy Wilson, Billy Joel, Annie Lennox, Sir Paul McCartney, Joni Mitchell, Smokey Robinson, Steely Dan, James Taylor, Tom Waits, Stevie Wonder and Neil Young. 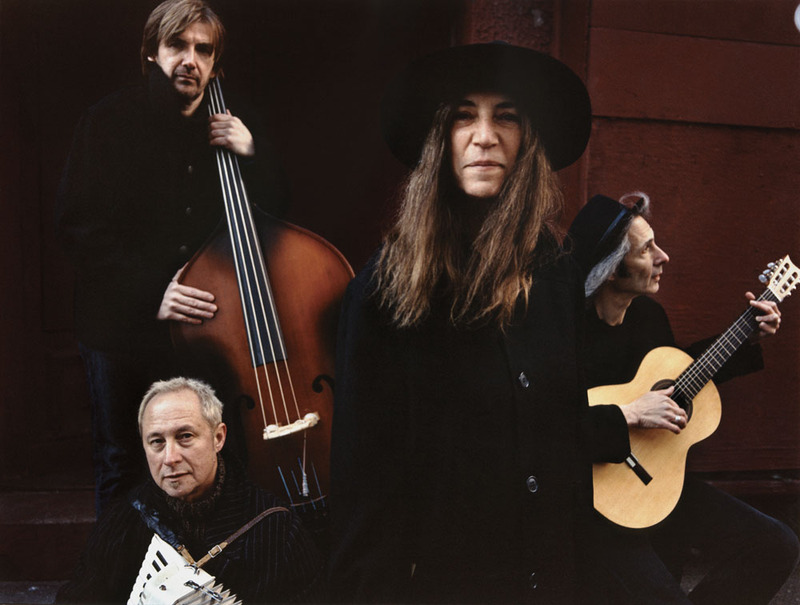 Patti Smith emerged in the 1970s, galvanizing the music scene with her revolutionary mergence of poetry and rock and roll. In 1975 the album Horses established Smith as one of the most original and influential artists of her generation. It was followed by eleven more releases, featuring songs such as "Gloria," �Free Money,� "Ask the Angels," "Ghost Dance,� �Because the Night," "Dancing Barefoot," "People Have the Power," and "1959." Smith was awarded the title of Commandeur des Arts et des Lettres by the French Republic in 2005 and in 2007 inducted into the Rock and Roll Hall of Fame. In 2008 Dream of Life, Steven Sebring's documentary film examining her life and work, was honored at Sundance. Recently she has released Just Kids, a memoir of her relationship with photographer Robert Mapplethorpe, who captured her trademark swagger for the cover of Horses. She is currently recording an album for Columbia Records with longtime collaborators Lenny Kaye, Jay Dee Daugherty and Tony Shanahan. In addition to the Founders Award, the songwriters and publishers of ASCAP's most performed pop songs of 2009 will be honored at the awards ceremony. Top awards will be given to Songwriter of the Year, Song of the Year and Publisher of the Year, in addition to the presentation of the ASCAP Vanguard Award, which recognizes the impact of musical genres that help shape the future of American music. The 27th annual ASCAP Pop Music Awards will kick-off the ASCAP "I Create Music" EXPO, a three-day conference dedicated to songwriting and composing. This year's EXPO features Quincy Jones being interviewed by Ludacris, a conversation with Bill Withers, an interview with John Mayer, and numerous panels, workshops, master classes, One-on-One sessions, song critiquing, networking events, product displays, state-of-the-art technology demonstrations, performances, and more. The EXPO will take place April 22-24, 2010 at the Renaissance Hollywood Hotel, in Los Angeles, CA. For more details, please visit www.ascap.com/expo. The Malibu Film Festival commences on Thursday April 29th at the Malibu Cinemas with a film retrospective and award presentation for Malibu resident and Oscar Winning Actor, Martin Landau. Mr. Landau will be honored with the Icon Award for his body of work and commitment to independent film. The Festival will wrap up in style with the Awards Gala. This night will honor the festival filmmakers and Academy Award Winner Lou Gossett Jr. Mr. Gossett will be honored with the Inspiration Award for both inspiring audiences for generations with his performances and for his till now unpublicized role in inspiring the idea for the Malibu Film Festival in the beginning. Lou was a financial supporter of the festival in its infancy. I was working on the film �Zooman� starring Lou Gossett Jr. in the late 90�s when the idea for the Malibu Film Festival was conceived. Lou was part of the festivals inspiration. Event Highlight: The Inspiration Award presented to Lou Gossett, Jr.